Just picked up the Ready to run inferno mp9 tki4. It comes with a pull start. The hobby shop said I should be able to use a bump starter with the pull start still installed. Im curious if there are option parts to lower the motor and bring the fly wheel lower out of the chassis for the bump start. Also if I remove the pull start is there a backplate cover I will need. Any help with item number r a link would be appreciated. You can leave the pullstart on the engine and still use a bump box. As Mugeyman said, you just have to ensure the flywheel hits the starter wheel. 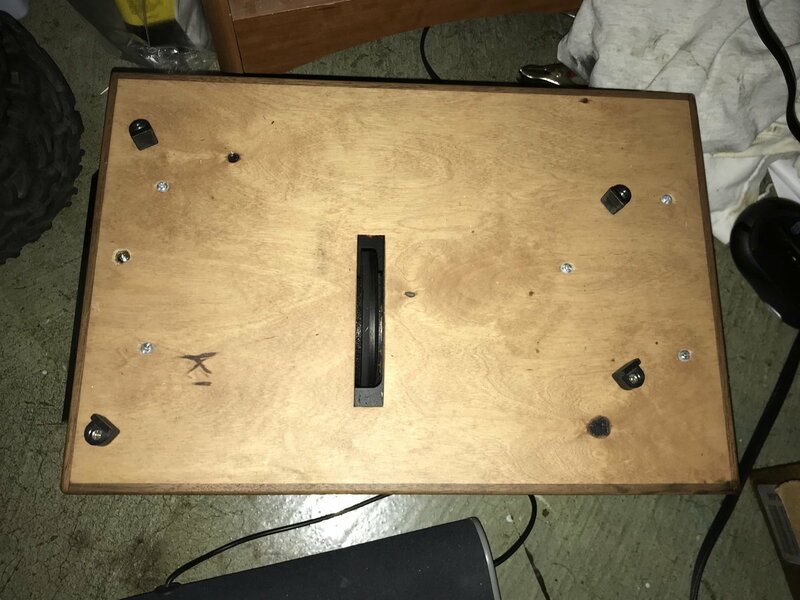 Just about any bumpbox should work, but you may need to customize the top to properly fit the chassis. A short video of my custom topped Ofna 10250 box with a Losi 8T 3.0 truggy on top. I used the little chassis tabs from the original box and just put them where they needed to be on the plywood top. I used 1/4” birch plywood (with a walnut border) and some simply 6-32 machine screws and nylon lock nuts. Works perfectly. Last edited by 1QwkSport2.5r; 12-30-2018 at 07:33 AM.